Have you seen the latest issue of Fat Quarterly? I just did and had to run straight to my sewing machine to make one of the projects -- the Spool Block Makeover by John Kubiniec. (hint: it is on page 81). John's pattern was for a quilt, but my schedule today didn't permit for that big of an impulse-sew (is that a real thing?). I decided to make a placemat instead. My mom, she-who-can-never-have-enough-taberunners, has decided that she can not have enough placemats, either. OK, Mom, I got the hint. I decided to put a section of the border on one side of the block to make the placemat. Is this not a great block? Will it not be a cute placemat? Run to your computer and buy the Fat Quarterly, then run to your sewing machine and make this block. It is too cute to resist! Several years ago at Quilt Festival, the Handi Quilter booth was across from the Cherrywood Fabrics booth. I wanted one of everything that I saw! That was one expensive quilt show for me. If you haven't seen (or touched!) Cherrywood Fabrics, then you haven't lived. I bought as much fabric as my luggage could hold. I finished this wrap at 6pm and had to leave for the party at 7pm. Why was I worried? This morning I was scheduled to teach a home-machine quilting class at the Quilt Basket. It was snowing and my students called to cancel. I found myself awake, showered, dressed and facing an unexpected full day at home. I'm not a huge fan of winter, but I do love a snow day! It was so much fun teaching for them. They have some other wonderful classes online that you should definitely check out. These have been gifted to some lovely young ladies. I hope they love them! C'mon. You couldn't have resisted them either. I love winter! OK, I do hate being cold and I do miss the sun, but in the winter I don't travel much to teach quilting and have time to stay home and sew! The blocks on the left are from a Block-of-the-Month at the Quilt Basket. The block on the right is a variation of Sugar Pop N Change from Moda Bake Shop. The variation is because I read the directions wrong. Last summer, I made myself a Christmas bedspread and pillowcases and shockingly remembered to put them on my bed in December. I had some fabric left over. Isn't that always the way? Moda Bake Shop posted a pattern for a gym bag a while back. I made the bag, but used cotton instead of PUL. It was a great pattern and I will definitely make another one. But, I still had fabric left. While I was at it, I pulled out my Wonder Wallet pattern and made a matching wallet. How cute is that? I have to put all of my Christmas fabric items away, but I can't wait to get them out to use again next December! This morning, a friend let me know that I was on Quilt It! on QNNtv.com. If you are a subscriber, the show can be viewed here. If you are not a subscriber, consider becoming one. 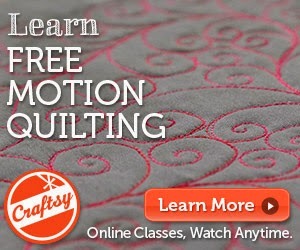 There are so many wonderful quilting shows to watch! Curried Tofu with Rice, that is. I'd invite you for leftovers, but there aren't any. I started the quilt sometime last year, quilted it in November/December, and recently finished the binding. The quilt has been shipped off to baby Hannah (born last fall) and I hope she loves it!